Hi everyone, I hope you are all having a great week so far! 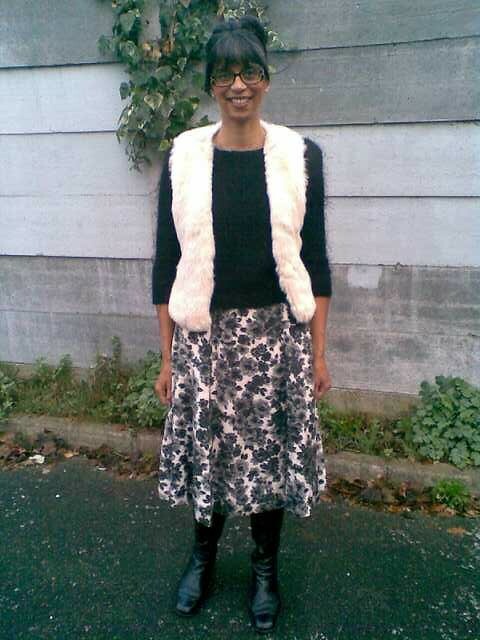 One of my key pieces for winter so far has been this faux fur winter white gilet by New Look, which I thrifted last year at the boot sale for only £2. I'm wearing it with another high street favourite of mine, this fluffy black jumper by River Island, which I purchased last year brand new. Both pieces are teamed with my vintage 50s skirt by Miss Worth-originally a dress, but altered into a skirt to make it a versatile and key item in my wardrobe. My black Clarks boots complete this winter look and black and winter white are definitely my favourite colour pallettes at the moment. What is your favourite colours to wear this winter season? Black! Most definitely black. And you look amazing in black. The boots look so great with this outfit in my opinion. I'm very into sapphires and blues- they enable the wearing of white all year round. Also a smart alternative to black! I need a furry vest! You look so brilliant, darling Sharon! My favourite colour this winter is still not in place. YOu see the weather is still not stabilised and whilst we're in December we've had days of 21 degrees Celsius which is warm and then just a jacket to warm up with when it gets nippy. I am looking forward to wearing my turquoise wool coat though - as soon as becomes just a bit colder. I' wearing bright colours this winter. Love this outfit on you! I remember you altering the dress into a skirt and what a great outcome! really an awesome mix, my dear! love that outfit a lot, that waistcoat goes so well with the skirt! I love to wear my mustard yellow winter coat, a pop of colour is great to fight the grey. I love the way you have mixed old with new and this outfit has worked really well. Red is probably my favourite. Very lovely outfit! Love the boots and the skirt prints. During our winter I like to wear lots of color and anything black and white. My favourite has to be red. Although I am also loving black too. That gilet looks super cosy. The whole outfit looks chic. Black is always a favorite of mine! Looking stylish and warm! I must get my gilet out too! 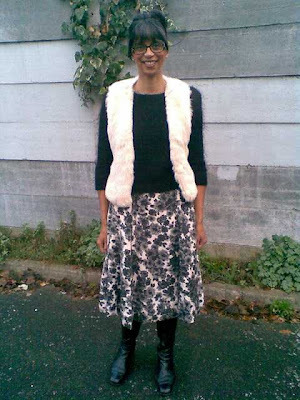 Hi Sharon, I love that furry vest of yours and what a brilliant idea to turn the dress into a skirt. I love black and white, it's so crisp.